Simplify cooking and make it less time-consuming using this Prestige Popular 550 Mixer Grinder for all your grinding and blending purposes. Designed in an upright space saving design, the mixer also comes with a water drain motor facility. The appliance is built with ergonomic and sturdy jar handles for convenient and comfortable grip. It is accompanied by two stainless steel jars and one multi-utility jar. The stainless steel blades provide better endurance. 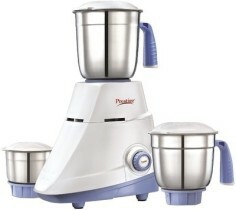 The Prestige Popular Mixer Grinder consumes around 550 watts of power for efficient functioning. The appliance comes with a motor overload protector that prevents the motor from getting damaged.